This title was first published in 2001. This informative volume gives penetrating insight into why multinational enterprises (MNEs) headquartered in Spain invested so heavily in Latin America in the 1990s. This is an invaluable resource for scholars of international political economics, international relations, economics, business and development studies and those with an interest in Spain and Latin America. 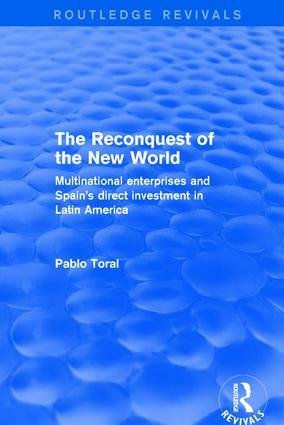 Contents: Introduction; Spanish direct investment in Latin America and the Caribbean: a historical approach; Creating alliances: frameworks for theory; Structural reform in Latin America and the Caribbean: the new role of FDI; Post-Franco Spain: new economic development and liberalization; The reconquest of Latin America: 500 years after; Conclusion: the competitive advantage of Spanish MNEs; Bibliography; Index. Professor Pablo Toral, Department of International Relations, Florida International University, USA. Instructor of International Relations and International Political Economy in the Department of International Relations at Florida International University (FIU) in Miami and Research Associate at the Latin American and Caribbean Center (LACC) at FIU Worked as a journalist between 1990 and 1995 in the United Kingdom, United States, Spain, Costa Rica, and Venezuela, for radio, television, newspaper, and news agencies.